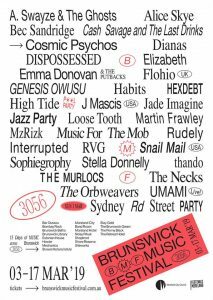 Often mistakenly recognised as merely the home of the Sydney Road Street Party, Brunswick Music Festival has decided to re-evaluate priorities, reorganise the sock drawer, reassess what sparks joy and revive its entire format. Unexpected spaces and brand-new faces punctuate the progressive, and frankly, EPIC 2019 program. Indefatigable industry figure Emily Ulman has taken the programming reins and roused one the city’s longest-running music festivals into the best shape of its life. Spanning March 3 –17, Brunswick Music Festival, put simply, is bringing the goods. The Orbweavers have created a new show especially for Brunswick Music Festival. They return to conduct another history lesson, this time about the suburb they hail from. Haunting and mesmerising and inspired by recent research, Brunswick Bluestone dives into the waterways of the basalt plains of the Newer Volcanics region (north of Brunswick and includes the Merri Creek area) and explores Brunswick’s industries of old: quarrying and textiles. 2018 saw thando complete a metamorphosis, kicking off the year with the release of powerhouse collaboration with REMI, which saw her reflect on her own identity as a woman of colour in Australia and her feelings of ostracism in the current political climate. 2019 sees Melbourne’s soul queen release her sophomore EP, featuring Melbourne’s best Zimbabwean artists in a tribute to her heritage.